Breed Group: Working Weight: 6-8 kgs Height: 30-32 cms Color(s): White, Coat: The Samoyed has a long and thick double coat and requires a lot of grooming. Distinct feature: they have long and silky fur with miniature size. Eyes and nose are distinctively black. They have punch face. Temperament: This is a very peaceful breed that tends to be very active. Very loyal, the Samoyed usually favors his master . This dog has the tendency to bark quite a bit, and will alert you when someone is approaching. Does not do well with smaller and more passive animals, but can do well with cats and other dogs. The Samoyed is very friendly and does well with children. 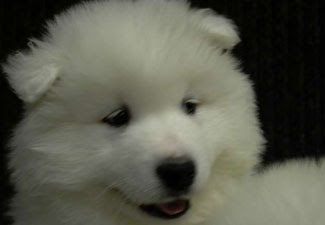 Activity: The Samoyed does best in cooler climates, but will do okay in warmer weather. Proper exercise is required as this breed can be lively. Large Dog Breed Bull Mastiff .. English Mastiff ..French Mastiff.. Neopolitan Mastiff ..Great Dane.. St.BernardMedium Dog BreedAustralian Sheperd ..Beauceron..Belgium Shepherd.. Boxer..Chow Chow..Dalmatian..Dobermann.. German Shepherd..Golden Retriever..Grey Hound..Irish Setter..Labrador Retriever.. New foundland..Pointer.. Rajyapalam..Rottweiler.. Rough Coolie..Siberian Husky..SMALL DOG BREED Basset Hound..Beagle.. Bichon Fries..Bull Dog – English ..FrenchBull Terrier.. Chihuahua..Cocker Spaniel..Dachshund..Jack RusselTerrier..Lhasa Apso..Maltese.. Miniature Pinscher.. Pekingese..Pit Bullterrier..Pomeranian..Poodle..Pug..Samoyed..Scottish Terrier..Shih-Tzu..Tibetan Spaniel..Yorkshire Terrier..